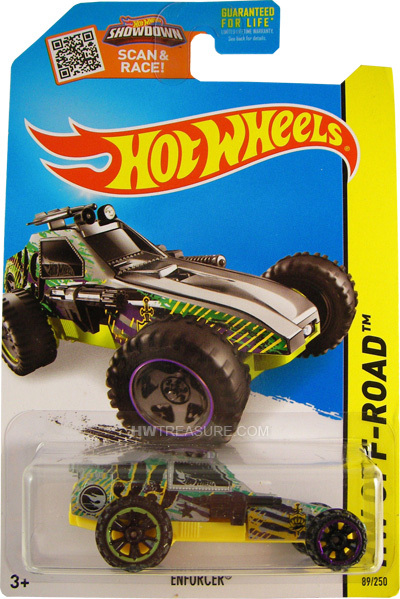 89/250 is part of the HW Off-Road series and the 2015 Treasure Hunt set. 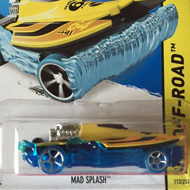 The gray car boasts sides with black, yellow & green graphics; a black & yellow “99”, a black low production symbol, and a white Hot Wheels logo. 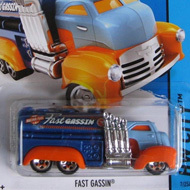 It has black windows, black guns on the sides, Off-Road 5-spoke wheels, and a yellow plastic Malaysia base. The fighting vehicle made its 1982 debut as the Megadestroyer. It was in the Megaforce series which was a collection of vehicles based upon the Megaforce action movie. It was later renamed Super Cannon and is currently known as the Enforcer.